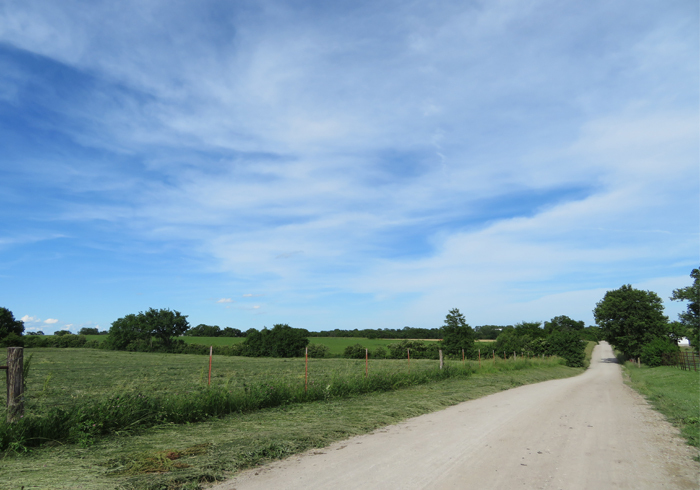 For the next days I was preparing for my visit to the Amish family near Kansas City. I rented a car, as it was about a 1.5 hour drive and there was absolutely no public transport to the country side, and I wanted to stay flexible, as you never know what happens. I started reading articles about the Amish and Pennsilvanian Dutch, and my biggest concern was to bring the right present. Finally, I decided to buy a basked with all kinds of German chocolats, which proofed to be a very good decision. On Wednesday morning, I dressed in my long black hiking pants and a long-sleeve blue sweather. I neighter wore make-up nor any jewellery and wore my hair in a bun. Obviously, I was going to stand out between the Amish in their traditional dresses, but I did not want to show up in a short summer dress and make them uncomfortable, so I tried to adapt a little bit to their customs. Then, I picked up the rental car and headed north. The navigation got me to the wrong house, but a nice Amish lady told me where to find the right house. I arrived and the wife opened the door with her little son on her arms. I handed her the basked with the German chocolates and she said that I was going to be picked up by the husband’s grandfather and a swiss-american lady [not Amish], who drives the car. Shortly later, they arrived and we took off on a ride to the grandfather’s daugther, who then joined us with two of her kids. We continued to the grandfather’s cousin, where we sat on the porch and started to talk the talk. It was amazing, but I was actually able to talk to the grandfather and his cousin in German. Slowly and with explanations here and there, but we talked. It turned out that I was able to understand them much better than they would understand me, as their Pennsilvanian Dutch is more and more mixed with English, and I speak both those languages. I also recognized that their pronunciation was very similar to the swabian dialect (from my home region), and it was the first time in my life that I wished I spoke that dialect fluently. The grandfather’s cousin showed my his old German bible and was astonished when I told him that we do not write like this anymore, as the bible was written in Fraktur script. Then, I handed him Otto’s diary where he read the beginning of his adventures. It was very funny to hear the story in a somewhat weird swabian accent, but he pronounced most words correctly and he understood most of it. We continued to the lunch gathering. We entered the house of another Amish family, where we encountered about 12 Amish women with countless children playing around the house and the gardens. Most of the women sat around a big wooden table finishing the work on some carpets which an Amish lady had started but had died the year before. I sat down at the table and before I was able to ask all questions, I was the one being questioned. I was already known as the German lady that the one couple met on the train, so I told them my great-great-grandfather’s story and how I was retracing it. To my surprise, they all knew about the Queen Mary 2 when I told them how I had come over by ship, because some of their friends had travelled on her to Europe on mission, as they do not use airplanes. We started to talk about language and it was funny how they knew certain words and had no clue about others. For example, they use the German word for fruit (Obst), but did not know about the word for vegetables (Gemüse). I was also an outside source of information for them and I was asked many questions about the technology level in Germany and if we had dairy farms “over there”. One of my funniest moments was when I saw that the drinks were served in red solo cups – nothing spectacular for the Americans, but for me they are a symbol of American College parties and beer pong, as I mostly know them from movies. Seeing them in the hands of Amish kids was a weird, yet funny moment. We visited the local bakery, where the sales girl was eager to meet the “German from the train” and the grandfather bought me some delicious cookies. I was also shown the local telephone house, where they could listen to their voice messages. After a short visit to the daugther [a mennonite], we went to the grandfather’s home where he showed me a quilt which was handmade for him and his late wife by their children. The quilt had the names of the entire family embroidered: 10 children, 52 grandchildren and 6 great-grandchildren. It was a very special moment for me to be shown something so personal. I headed back to the couple’s home (whom I’ve met on the train) for the dinner gathering. The family had a monthly gathering that night and shortly after, the house was filled with family members, many children of all ages and also one non-Amish American couple who were friends of the family. After a lovely dinner, supplied by all participants, we went outside to sit around the bonfire and sing songs. The children distributed self-made song books for everyone and the Grandfather got his harmonica out. So I found myself singing German christian songs, sitting around a bonfire and sourrounded by the glowing lights of the beautiful sunset. They asked me to sing a German song for them, and I decided to sing the full version of the “Abendlied”. After this amazing day of peacefulness, calmness and friendship it was time for me to say goodbye. The grandfaher hugged me so strongly as if he did not want to let me go, confessing that I had made his day and thanking me for coming to visit them [I thought it was my turn to thank them!]. From the couple that I had first met on the train I received a book as a parting gift with a personal, handwritten dedication for me. I took off in the dark with a heart full of joy and gratitude for this wonderful day. Note: I took about one photo of the landscape during the entire day. The Amish do not like having their photo taken and I decided not to ask for one, as this would have made me the tourists in that very moment. I am still in contact with the family, who call me regularly to see how I am doing on my journey (as the cannot read this Blog). This entry was posted in USA, Travel and tagged Amish, German Heritage, Missouri. Bookmark the permalink. Spannende Geschichte! Freu mich, für dich, dass du sowas erleben durftest. Die Amish sind toll, wären wir alle wie sie, wär die Welt sicher besser. Ja, Pennsylvanian Dutch versteht man als Schwabe recht gut ;-). Hab ich mir auch schon oft angehört. Faszinierend, diese alten “Überbleibsel” an Sprachen.